Abstract | In her documentary photographs of Chinese restaurants in small-town Alberta, Elyse Bouvier recalibrates intimacy. Her photographs wrench the intimate out of the sphere of the domestic and the private and insert it into the realm of the communal and the public. They offer us a vision of the kind of intense relation that can exist between strangers—stranger intimacy. Moreover, the images assert a temporality that is necessary for this recalibration. Intimacy does not exist outside of time. These photographs insist upon, and demand, an understanding of intimacy that is not only strange, but also deeply structured by a complex temporality—a kind of uncanny double take or déjà vu. Bouvier’s photographs demand that the viewer pause and dwell in the déjà vu that they produce. Résumé | Dans son documentaire photographique sur les restaurants chinois des petites villes rurales albertaines, Elyse Bouvier réévalue l’intime. Ses images arrachent l’intime de la sphère domestique et privée et l’intègre à l’espace communautaire et publique. Ces images nous offrent une vision du genre de relation intense qui peut exister entre inconnus- intimité étrange. De plus, les images affirment une temporalité nécessaire à cette réévaluation. L’intime n’existe pas en-dehors du temps. Ces images demandent et insistent sur une certaine compréhension de l’intime qui est non seulement étrange mais aussi profondément construit par une temporalité complexe ; une sorte de temps d’arrêt troublant ou de déjà-vu. Les images de Bouvier exigent que le spectateur s’arrête et s’attarde sur le sentiment de déjà-vu produit. Look at Elyse Bouvier’s photographs of Chinese restaurants and look again. Look at the photographs of every ginger beef dish she ate while documenting Chinese restaurants in small towns across Alberta (you have a small sample in “Plate #1, #2, #3, and #4”). When you look at them, you may not see the more than 4000 kilometres she drove, nor the nights she spent sleeping in her car, nor the days she spent staring down a highway that never seems to end. You may not see the way in which these photographs connect a vast and disparate geography. But you will look again, not least because they are terribly familiar and, mingled with that familiarity, also strange. Bouvier’s photographs recalibrate intimacy. They wrench the intimate out of the sphere of the domestic and the private and insert it into the realm of the communal and the public. They offer us a vision of what Leo Bersani and Adam Phillips explore as the intimacy between strangers—stranger intimacy. Moreover, they assert a temporality that is necessary for this recalibration. Intimacy does not exist outside of time. These photographs insist upon, and demand, an understanding of intimacy that is not only strange, but also deeply structured by a complex temporality—a kind of uncanny double take or déjà vu. Bouvier’s photographs demand that the viewer pause and dwell in the déjà vu that they produce. Bhabha identifies the experience of the unhomely as having “a resonance that can be heard distinctly, if erratically, in fictions that negotiate the powers of cultural difference in a range of transhistorical sites” (9). While Bhabha writes about literature, his argument for attending to the disquieting possibilities of the terribly familiar offers an important route into understanding the stranger intimacy of Bouvier’s photographs. These photographs chart the disquiet of the familiar by breaking down the divide between private and public experience. Specifically, the images break down the supposedly private trauma of displacement with the public one of living in diaspora. Bouvier documents the displacement of communities in diaspora: Chinese and Vietnamese families working and living in places that are far removed from the places that were, in another time, home. Yet there are other displacements at work here too. There are the men who come in for coffee in search of a sense of community that cannot be found in the space of the private home (“Morning in St. Paul” and “Breakfast with Louis”). There are the children playing and doing homework at the back of the restaurant (“Jeff’s Daughters”). There is the persistence of the menaki-neko, the Japanese cat with its paw raised in a perpetual gesture towards the hope for good luck (“Lucky Dragon”). Take, for example, the intricate invasions of history of just the menaki-neko. Consider the strange familiarity of a Japanese cat in a Chinese restaurant operated by Vietnamese people in a town largely devoid of Japanese, Chinese, or Vietnamese people. Chinese immigrants of my father’s generation experienced the terror of the Japanese assault on China in the 1930s. China invades Vietnam in 1979. In Canada, Chinese immigrants who were early restaurant owners and workers would have been subjected to a head tax as well as outright exclusion from 1923-1947. These intricate histories of violence resonate in the innocuous wave of one purportedly lucky and luck-bearing cat. Yet this symbolic object is not merely one cat, but a repetition of cats in every restaurant. This repetition functions, in Bhabha’s terms, as the terror of the déjà vu, of the unhomely moment, how it uncovers the public secrets that secure the ordering of civil society. Thus, for example, feminism makes visible an unhomely moment in civil society by specifying its gendered and patriarchal nature and disturbing easy distinctions between private and public life (Bhabha 11). In so doing, the “unhomely moment relates the traumatic ambivalences of a personal, psychic history to the wider disjunctions of political existence” (Bhabha 11). The terror of the déjà vu is not quite that of being haunted by a history one cannot rightly place, but rather that of being given a flash of insight into a secret, intimate knowledge that has always been open but open in such a way that it seems to be discreet, separated from other knowledges and other spheres of life. Bouvier’s photographs insist on uncovering these knowledges and articulating the connections between people, communities, and histories of displacement. If the history of Chineseness in Canada has been marked by systemic, legislated racism (for example, the Chinese Immigration Act 1885, 1905, 1923) and forms of unofficial, subtle, and unsubtle racism, then the place of the Chinese restaurant in small-town Canada attests to the ways in which this history is hidden away, suppressed, and overridden by the power of what it means to live in disjunction. That is, these photographs show how these histories of division and discrimination exist, with a kind of uncomplicated ease, alongside the unfolding of daily lives that are concerned with connection and comfort. In “Morning in St. Paul,” three men experience the conviviality of a Chinese restaurant’s hospitality. Away from home, they are also at home. “Morning in St. Paul” reveals much about the stranger intimacy of small-town Chinese restaurants. The men in this photograph are regulars. They know this place. Here, for them, there is ease. There is the deep comfort and familiarity of scrambled eggs and toast and coffee. There is a moment of leisure, of leaning back with an elbow on the table and another on the back of the chair. Yet there is also a disturbance here. Peering out over a corner of the table, just slightly right of the center of our photograph, behind the napkin dispenser, there is a disquietingly comedic figure. He wears a red cap and smile so wide that it drags the eyebrows upward. He is jolly and fat with a double chin. If he were real, that chin would move with every guffaw. He might be Chinese but it is hard to tell. Even this vagueness is part of the disturbance. He is decidedly foreign. He is not like these men at the table. His laughter is decorative. His smile is frozen in time and the atemporality of his joy haunts the real pleasures at this table. He enacts an intimate invasion. He is both a fixture and affixed to the histories of displacement that make that other ease possible. In order for this morning in St. Paul to unfold, in order for this public comfort and this ease to exist, a series of private traumas of displacement and isolation must also be present. Someone left home to make this other home. Someone gave up family in order to carve out this other space of familiarity. My point is not just that Asian immigration—and all of the sadnesses attendant upon the process of immigration, no matter how desirable—makes possible the public sphere of the small-town Chinese restaurant. Rather, I want to stress the intricacy of these restaurants as transhistorical sites that contain multiple registers of loss and displacement. The dissolution of the boundaries between private pain and public joy offers a way into the discrete terror of the déjà vu, of looking again to see the haunting of histories that will not stay put, that refuse to be outside of the frame. Bouvier makes visible the uneasy distinctions between private and public life in communities defined both by the intimacy of their demographic scale (population of St. Paul, Alberta, 5400; Wainwright, Alberta, 5925; Bonnyville, Alberta, 6216; Rocky Mountain House, Alberta, 6933; Consort, Alberta, 689; Stavely, Alberta, 505; Turner Valley, Alberta, 2167; Trochu, Alberta, 1172) and by the vastness of their geographical locations. “To think of the West in Canada is to think of great distances and the machines for traversing them,” writes Craig Campbell of the “rural scene” in Kyler Zeleny’s photographs of communities of fewer than 1000 inhabitants in the Canadian West. The distances that Campbell evokes, distances that are very real, do not appear in the images collected in Zeleny’s Out West. Almost without exception, Zeleny’s photographs are tightly cropped and focused on specific objects—road signs, a lone building, and, more than anything, the carcasses of abandoned cars. In Out West and in Bouvier’s photographs, there is a tension between emptiness and inhabitation. Take, for example, Bouvier’s “Ng’s Café” and “The Diana.” There are tables, chairs, and napkin dispensers. No one is sitting in the chairs; no one is at the tables. Further emphasizing emptiness through signs of presence, in “Ng’s Café” the table is set for one; there is an empty water glass and the fortune cookie remains unwrapped. “Ng’s Café” and “The Diana” show the possibility of habitation while maintaining the emptiness of these spaces—a tension that plays out with particular acuity in the surfaces of both images. There is a shiny quality to everything: the green wall in “The Diana,” the vinyl of the chairs, the tabletops, the metal of the napkin dispensers. These spaces are not simply empty; they gleam with emptiness. No patron could sit at those tables without marring this gleam. This emptiness is not that of dust and tumbleweeds, but rather an aggressively glossy emptiness. It is not passive, but comes out of hard work. There is something untouchable here. Bouvier’s images capture a loneliness that is not a product of neglect and abandonment. It is a loneliness that functions at the nexus of the tension between emptiness and inhabitation. It is the loneliness of the unoccupied table. There are, of course, people behind the counter and past the swinging doors. One of the great achievements of this series lies in Bouvier’s ability to capture something of these lives. “Cam in Wainwright Steakhouse,” “Clara in Consort,” “Lori in the Diana,” “Jeff’s Daughters,” “Sam and Amy,” and “Sam’s Turkey Sandwich” all attest to the relationships Bouvier builds with her subjects and with these spaces. These relationships speak to the power of stranger intimacy. This intimacy exceeds the sphere of the domestic, of the family, of privacy. It operates with a different kind of temporality than conventional intimacy. A logic of disclosure governs conventional intimacy. Knowing someone, knowing their histories and their secrets, is the fundamental basis of intimacy as we have typically known it. However, as Bersani and Phillips propose, it does not have to be that way. Perhaps, they suggest, we are mistaken in thinking that such knowledge can lead to greater closeness. Perhaps we do not need to depend so much on the past in order to find our way to intimacy. As Lisa Lowe observes, “intimacy as interiority is elaborated in the philosophical tradition in which the liberal subject observes, examines, and comes to possess knowledge of the self and others” (21). Instead of this desire for examination and possession, Bersani and Phillips want to find “a new story of intimacy that prefers the possibilities of the future to the determinations of the past” (viii). Bouvier’s photographs of the people behind the counter and past the swinging doors offer a beautiful articulation of intimacy that opens the possibilities of the future. The camera does not know them. They do not know the camera. But there is still knowledge here. Thus, when I note that these images attest to the power of Bouvier’s relationship to her subjects, I do not mean that she necessarily spent a lot of time with them. Rather, I mean that Bouvier’s work opens up a story of intimacy that is not governed by the knowledge and possession of the histories of her subjects. A relationship to history and a commitment to futures embody the particular intimacy of these restaurants. These are the places where almost everyone is a regular who knows Cam in Wainwright, Clara in Consort, Lori in the Diana, Jeff’s daughters, and Sam and Amy. They do not need to know their life stories; indeed, such stories are typically not on offer. My parents had little interest in revisiting the traumas of the past that lead them to the restaurants where they worked. The point is to start a life and to make out of that life something other than what it was. It is not an erasure of the past nor denial. It is a privileging of that which is to come, of that which is still becoming. Such a privileging is not a refusal of intimacy. Indeed, Bersani and Phillips suggest that stranger intimacy, where we do not need to know the other, but only to trust in the knowing that will come, might be intimacy par excellence. Notably, this intimacy turns on a shift in temporal emphasis. Instead of a divulging of the past as a basis for intimacy, Bersani and Phillips signal the necessity of a turn towards the future. Such a turn offers a way to understand the temporality of stranger intimacy in Bouvier’s restaurants. 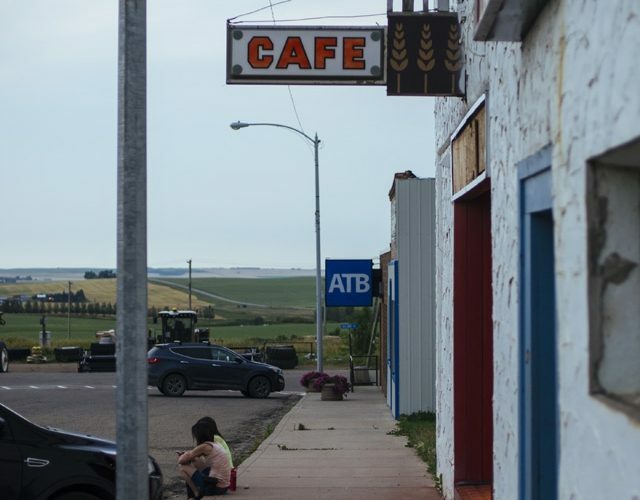 As I observe in Eating Chinese, the small-town Chinese-Canadian restaurant has been situated as a marker of a disappearing form of rural life, or what Zeleny refers to as “rural drain, urban claim” (103). I note that there is a narrative of the “premature requiem” attached to these spaces. However, I challenge this narrative: “it is precisely at the moment when something is declared to be outdated that the investment in the dating of things, their situatedness in history, reveals itself” (Eating Chinese 7). Casting this challenge within the frame of stranger intimacy allows us to understand the complex temporality these restaurants occupy. They are not markers of a disappearing past. Yet they do seem to be, in Zeleny’s evocative phrasing, places “of past construction” (105). Their pastness is not the only way to locate their cultural significance; we can also grasp their intimate invasions within the frame of their futurity. Even the limits of this intimacy indicate its power. “Lan in Mr. Chin’s” strikingly illustrates this limit and the power of this intimacy. The mirror seems to give us almost nothing—Lan’s back, a closed door, the reflection of the light on the wood paneling. “Lan in Mr. Chin’s” seems to be a photograph of enclosure and capture. The mirror appears to offers only the suggestion of access to Lan, to what might beyond the door, to the space of the restaurant itself. Yet it is this very evocation of access and its denial that indicates the truth and power of the recalibration of intimacy in Bouvier’s photographs. In this photograph, there is a precise echo of the glossiness I noted earlier in “Ng’s Café” and “The Diana.” Find it in the reflection of the light on the wood paneling. Find it on the surface of the counter behind Lan; the corner of the doorframe; the baroque edges of the gilt mirror; the sheen of the brocade wallpaper; the curve of the brass sconce. Find it even on the collar of Lan’s shirt and the sharp angle of Lan’s cheekbone. In these abundant reflections, so luminous in an image that is also enrobed in darkness, the viewer might see themselves indirectly, askew, adjacent to the intimacy on offer. While the intimate may suggest an interiority divorced from political engagement, stranger intimacy can be a politically enabling possibility. This intimacy does not traffic in individual histories, but rather collective ones that make the invasions of history and memory something to be held in trust. Bouvier’s photographs offer a way into living with disquiet and the disjunctures of history. Thus, the assemblage of the materials and objects in “Coffee at Mr. Chin’s” signals the ways in which the unhomely moment can offer a point of entry, a way of understanding that we do not need to stave off the disquieting déjà vu. Instead, we can transform private terror into a kind of public sanctuary. In Bersani and Phillips’ example, Isabel Archer realizes in the flash of a moment at the Palazzo Roccanera that her world is not quite right and she retreats as her world moves increasingly, insistently inward. However, taking Bersani and Phillips seriously allows for a reorienting of that moment that does not give in to the inexorability of the inward turn. Stranger intimacy suggests that intimate invasions might become a resource for living in displacement. For Bersani and Phillips, depersonalizing the past demands reimagining it in order to craft an intimacy that is not based on any singular story. “Coffee at Mr. Chin’s” might be easily read as a celebration of hybridity and multiculturalism. The china teapot lid is jauntily perched on the pitchers of coffee at the “Bunn-o-matic” warmer station. In the background, the coffee station is flanked by a repurposed Chinese mooncake tin and a box of Red Rose tea, that great commodity of British imperial histories. However, it is also an image that recalibrates intimacy by depersonalizing it. These objects, and the histories that they signal, belong to everyone and to no one. They offer a powerful, collective form of uncanny inhabitation. No matter which side of the swinging kitchen door you occupy, there is some kind of a déjà vu here for you. Bersani, Leo and Adam Phillips. Intimacies. Chicago: U of Chicago P, 2008. Bhaba, Homi. The Location of Culture. London and New York: Routledge, 1993. Campbell, Craig. “The Rural Scene.” Out West. Ed. Kyler Zeleny. London: The Velvet Cell, 2014. 91-96. Cho, Lily. “Intimacy Among Strangers: Anticipating Citizenship in Chinese Head Tax Photographs.” Interventions 15.1 (2013): 10-23. — . Eating Chinese: Culture on the Menu in Small Town Canada. Toronto: U of Toronto P, 2010. Lowe, Lisa. Intimacies of Four Continents. Durham and London: Duke UP, 2015. Shah, Nyan. Stranger Intimacy: Contesting Race, Sexuality, and the Law in the North American West. Oakland, CA: U of California P, 2011. Zeleny, Kyler. Out West. London: The Velvet Cell, 2014.